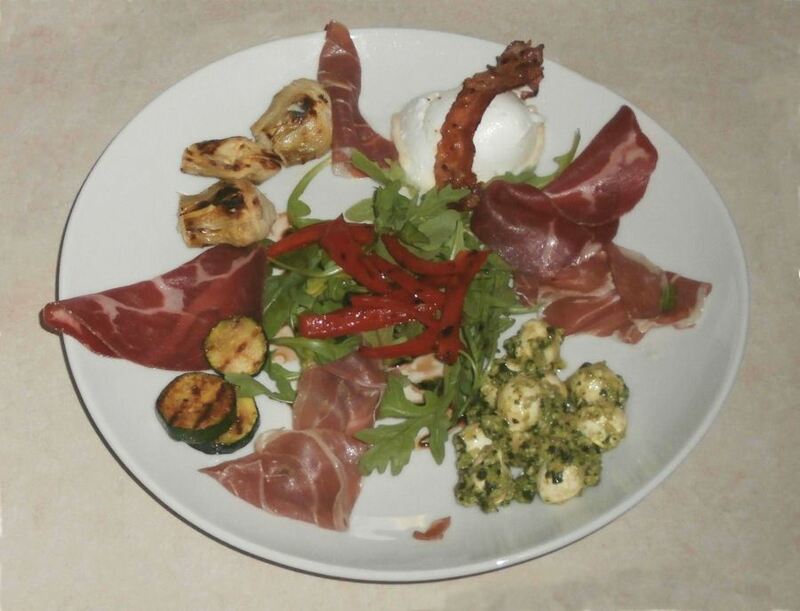 Chef Dino of the Italian restaurant "Faule Magd" in Ueberlingen/Germany, made this antipasti platter for me several times. I decided to recreate it at home. This is an Italian bacon, made of pork belly meat that is salt cured and spiced with black pepper and sometimes other spices. This is an Italian porc cold cut, made from the dry-cured muscle running from the neck to the 4th or 5th rib of the pork shoulder or neck. Fresh pesto - see ingredients above and recipe below. if your grocery or deli store doesn't have them, try espelette or anglet peppers (mild red pepper), fried in some olive oil at low heat and some coarse salt added. I tend to hate olives, but I don't mind olive all'arancia - small black olives marinated in wine vinegar, olive oil, finely diced orange peel, garlic and chili pepper. I also don't mind Greek-style olives, in olive olive oil, lemon juice, rosemary, coriander, and garlic. Griddle, preferably ribbed (to get nice grill marks). Put all ingredients in a food processor / kitchen machine, and whiz until a puree consistency is obtained (you may have to stop several times and scrape the ingredients off the inside of the machine with a spatula). Done! Iin a frying pan, fry the bacon slices until browned on both sides but not crispy - do not add oil or butter to the pan! Drain the artichoke hearts, carefully squeeze each one in your fist to get the liquid out (do not mush them! ), then cut in half lengthwise. Cut the red pepper lengthwise into thin strips (about 1/ cm ; 1/4"), seeds and core of the pepper removed, then grill as above. If the bacon slices are too short, don't worry: just drape them across each cheese ball. Optional: add 2 avocado wedges; you may put some of the pesto on it. Serve with grissini (Italian breadsticks). My recipe - also from Dino - is here.